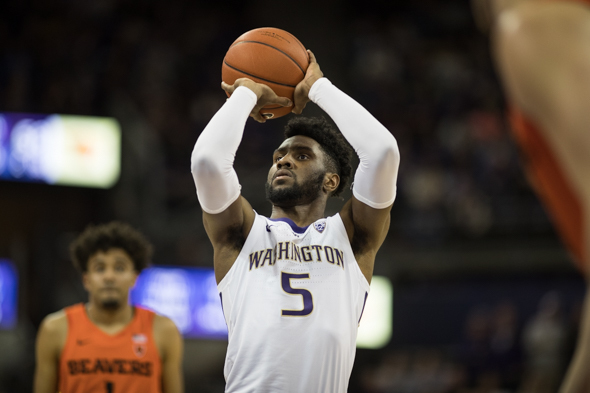 Huskies take the three top Pac-12 individual hoops awards: Hopkins is coach, Jaylen Nowell is player and Thybulle is defensive player of the year. Big awards day for University of Washington men’s hoops. Since the inception of the defensive award 16 years ago, it’s the first time all three awards have gone to the same school in the same season. Nowell’s selection as POY was considered a bit of a surprise, since Thybulle’s season as a defender was so singularly game-altering. But the Pac-12 coaches apparently figured that, with the Huskies winning the regular-season title by three games with a 15-3 record (24-7 overall), there was justification to spread the love. Thybulle was the second player in Pac-12 history to repeat the defensive award. The POY award was Washington’s first since Brandon Roy in 2005-06 and third in program history, joining Christian Welp (1985-86). Nowell was the youngest among them. Hopkins’ back-to-back honors make him the first coach in league history to earn the award in each of his first two seasons with a program. He’s the fourth coach to repeat, joining Stanford’s Mike Montgomery (1999-2000; 2003-2004) and Arizona’s Lute Olson (1988-1989; 1993-1994), as well as Oregon’s Dana Altman (2015-2016). Washington’s first regular-season conference title since the 2011-12 season, as well as UW’s 15 wins in conference play — tied for the most in program history — came two years after a 2-16, 9-22 season ushered out coach Lorenzo Romar. Washington’s back-to-back 20-win seasons made Hopkins the second UW coach in program history to reach 20 wins in his first two years, joining Tippy Dye (1952-53). Washington had a different leading scorer in each of the final nine games of the season. The Huskies defense held opponents to just 62.3 points in conference, tops in the league. Per College Basketball Reference, Nowell posted the season’s most efficient stat line (16 ppg/5 rpg/3 apg/50% FG/40% 3FG) and would be one of just three conference players – Roy in 2005-06 and Arizona State’s James Harden in 2007-08 — to record the line over the past 25 seasons. Thybulle became just the second player in Pac-12 history to repeat as top defender, joining Oregon State’s Gary Payton II (2015-16). He’s one steal shy of becoming the 28th player in NCAA history to reach 111 steals in a single season. Thybulle leads the NCAA, averaging 3.55 per game. His 315 career steals leads all active players. This marks Hopkins as a total stud of a HC and is quite a feather in the cap of AD Cohen. To make such an immediate impact is perhaps unequalled and my oh my, what a difference 2 years can make when the right person is hired! Hop seems to be loyal to a program (22 years as Syracuse asst) and as this is now HIS program, let’s hope he shows the same long term loyalty. As he has increased the gate revenues greatly already, Jen will have the $$$ to keep him here. Who knows, UW may even get on TV once in a while! Speaking of “ushering out,” Romar’s Waves were pummeled by Gonzaga last night.